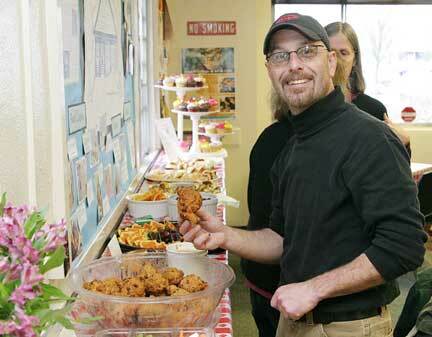 Joe Kaczyk brings Black Bean Fritters, courtesy of The Delta Caf?©, to the Woodstock Community Center Open House. Times haven’t been easy for Friends of Woodstock Community Center recently. Time after time, the city has threatened to pull funding for the center, and shutter it forever. 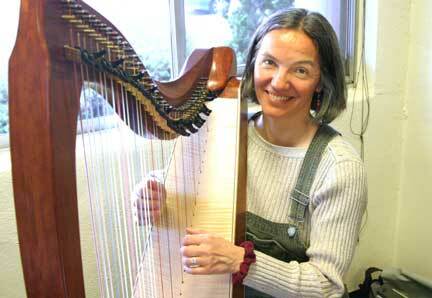 Florence Dezeix plays a Celtic harp, filling the community center with the warm, lush sounds of merry melodies. However, on February 10, the stately community center, once a city fire station, is full of life. “There have been some “close shaves” for the center’s closing, acknowledges volunteer Terry Griffiths. “Indeed, some very, very ‘close shaves’,” Griffiths agrees. 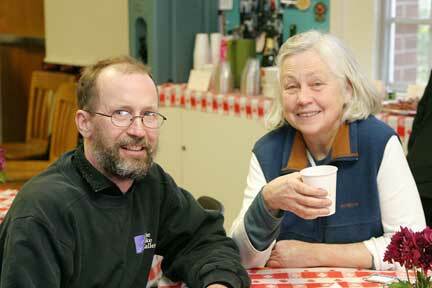 Woodstock Community Center volunteers Randall Magahay and Terry Griffiths relax at the Open House. The kitchen counter is laden with treats. We see cupcakes brought in by Island Creamery, His Bakery scones, New Seasons’ offering of fruit and bread, Delta Caf?© fritters, and Papaccino’s coffee. Alison O’Donoghue exhibits her buttons and painting, sketches on her current work, and chats with passers-by. We moved into the Mirror Room, and found it filled with works of art. 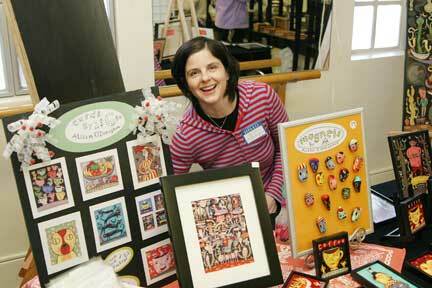 Proceeds from this art sale help support the community center, we’re told. Artist George Heath offers his “sculptural cartoons” for sale at the Open House. We meet George Heath. 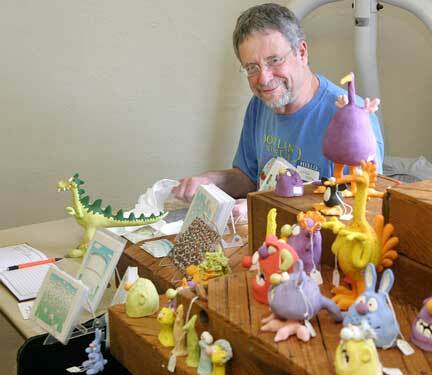 “I just create what comes to mind when I make my ceramics.” Asked what he calls his cheerful, colorful artworks, he first says, “Well, they’re called Earl, Bob, Ted ‚Äì and Bill! Hillary is yet to come.” He pauses, searching for a better answer to our question; then opts for the term, “sculptural cartoons”. 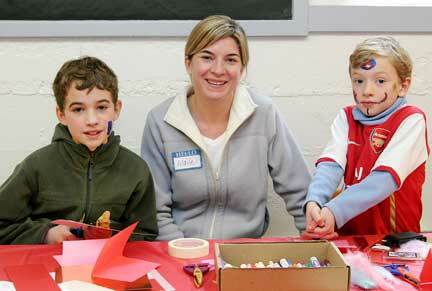 Making Valentine’s Day cards is Maile Baures (center), between her sons Adrian and Loic. The basement has been turned into a children’s art workshop. Pink paper, hearts and other Valentine’s Day decorations abound, as kids make cards for family and friends. Learn more by going to www.woodstockpdx.org.